The legality of special counsel Robert Mueller’s investigation into Russia meddling and possible collision by Trump’s campaign is facing its most significant challenge since he was appointed in April 2017. Lawyers for witness Andrew Miller, an associate of Trump’s longtime confidant Roger Stone, asked a federal appeals court on Thursday to end the investigation on the basis that it has no legal authority. It’s the first challenge to Mueller’s authority that has reached a federal court of appeals. Mueller’s job was made even more precarious this week when the president replaced Attorney General Jeff Sessions with Trump loyalist Matthew Whitaker, who could take over the special counsel investigation from Deputy Attorney General Rod Rosenstein. 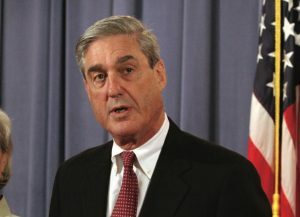 Miller’s lawyer, Paul Kamenar, argued that Mueller’s power is excessive and outside the bounds of law because the special counsel position was created in regulation, not by a congressional statute. Trump has long called the investigation a “witch hunt,” even as some of his allies have pleaded guilty to numerous charges and even have cooperated with federal prosecutors. Posted: 11/9/18 at 10:34 AM under News Story.